Engineering and Physics cannot be thought of without models; models, which represent the real world to the best of our knowledge. Before starting with any mathematical description, we must establish something like a phenomenological picture, a symbolic map of the real world’s structures with elements like masses, springs, dampers, fluid system, thermodynamic elements, and so forth and, most important, with elements of interconnections. 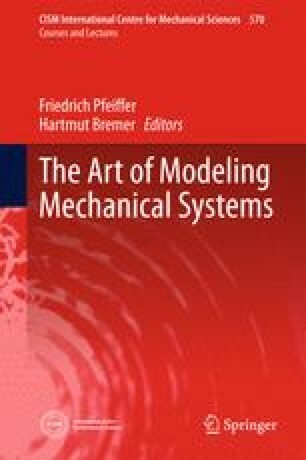 This first step of mechanical modeling is mostly underestimated, but it decides very substantially about the success of all following activities like mathematical modeling, numerical algorithms, and finally computer codes. Therefore, it is worth looking at that more systematically, in spite of the fact that there do not exist systematic approaches to these problems. Establishing models includes very strong phenomenological issues. Models should be as simple as possible and so complex as necessary, not more and not less, and all this is still more an art than a science. Geier, Th., Foerg, M., Zander, R., Ulbrich, H., Pfeiffer, F., Brandsma, A., van der Velde, A. (2006). Simulation of a Push Belt CVT considering uni- and bilateral Constraints. Second International Conference on Nonsmooth/Nonconvex Mechanics with Applications in Engineering, Thessaloniki, 2003, ZAMM (Vol. 86, No. 10, pp. 795–806) doi: 10.1002/zamm.200610287.